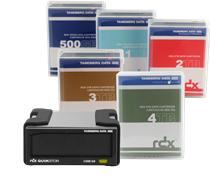 The RDX QuikStor media-based removable storage system offers rugged, reliable and convenient storage for backup, archive, data interchange and disaster recovery. It provides enterprise performance and fast access, with transfer rates of up to 1,188 GB/hr and capacities up to 3 TB per cartridge. Vast capacities: 500 GB, 1 TB, 2 TB, 3 TB or 4TB of hard disk capacity or 128 GB, or 256 GB of solid-state disk capacity on one piece of media. Write and read access is near-instant allowing users to work directly with the data on the media like one would with any other hard disk drive. With RDX capacities ranging from 500 GB, 1 TB, 2 TB, 3 TB to 4 TB and RDX SSD media capacities ranging from 128 GB and 256 GB, users have enough capacity to support a wide range of storage requirements, ensuring their data is fully protected. The external RDX USB3+ drive only needs a USB 3.0 connection to work. It is as easy to use as an external USB disk drive but much more robust and reliable. This enables RDX for outdoor usage like scientific data collection, in the media and entertainment environment, mobile workforce or just for easy data distribution across locations. The RDX QuadPAK allows up to 4 RDX external drives to be securely installedin a 19″ rack to simplify backup and restore operations. This enables RDX to coexist with other IT equipment like servers, disk systems and network components in one rack. RDX WORM enhances RDX for compliant archiving (optional software solution). RDX Cartridge Encryptor (RCE) is free software to encrypt data stored on RDX media. ** This functionality is only available with our USB3.0 RDX drive.